I keep looking at these photos and try to imagine what kind of lives these people have…Because as hard as it is for us to admit, humans are a a very cruel species and many of them are simply incapable of compassion. 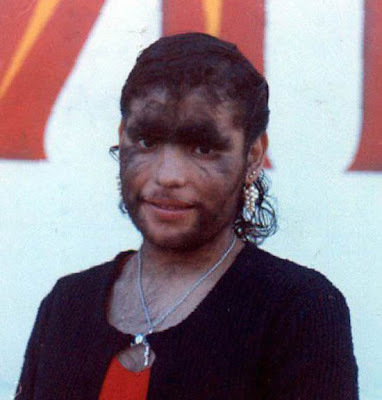 Imagine what it’s like to go out for a simple walk and have people looking at you, some just because they’re curious, others showing disgust and others just making fun…And all this because you were unlucky enough to suffer from a rare genetic disease called hypertrichosis. Statistics say hypertrichosis, or the werewolf syndrome, is so rare that it occurs for 1 out of 10 billion people, However there are 19 people alive diagnosed with this disease, out of 6.5 billion people, so it’s more like 1 in 340 million.